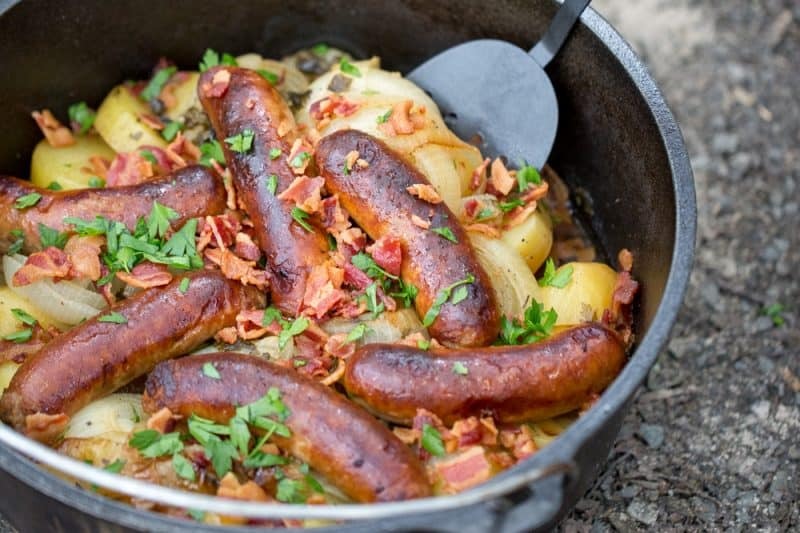 The Dublin Coddle is a savory Irish classic made with potatoes, onions, rashers (bacon) and bangers (sausages) with a little chicken broth and beer thrown in. 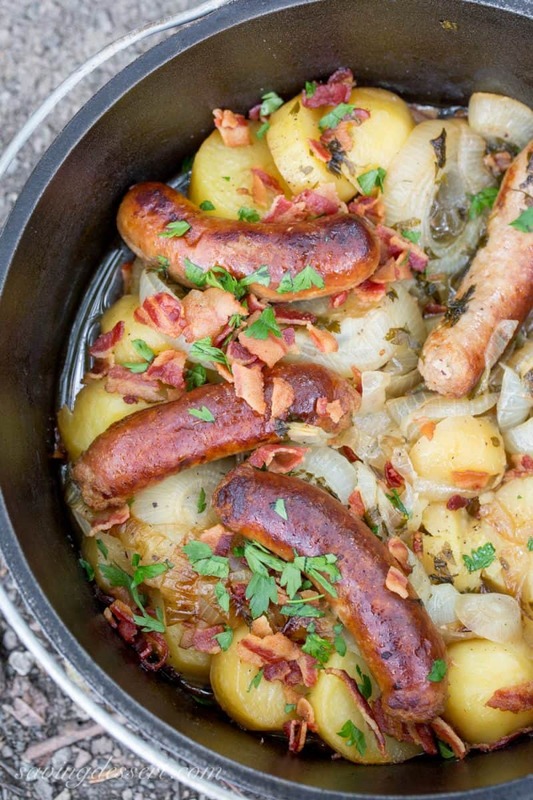 First, let’s just jump right in and talk about this amazing pot of Irish comfort food! Last weekend we went camping in Shenandoah National Park with our two dogs and a cooler full of wonderful ingredients. 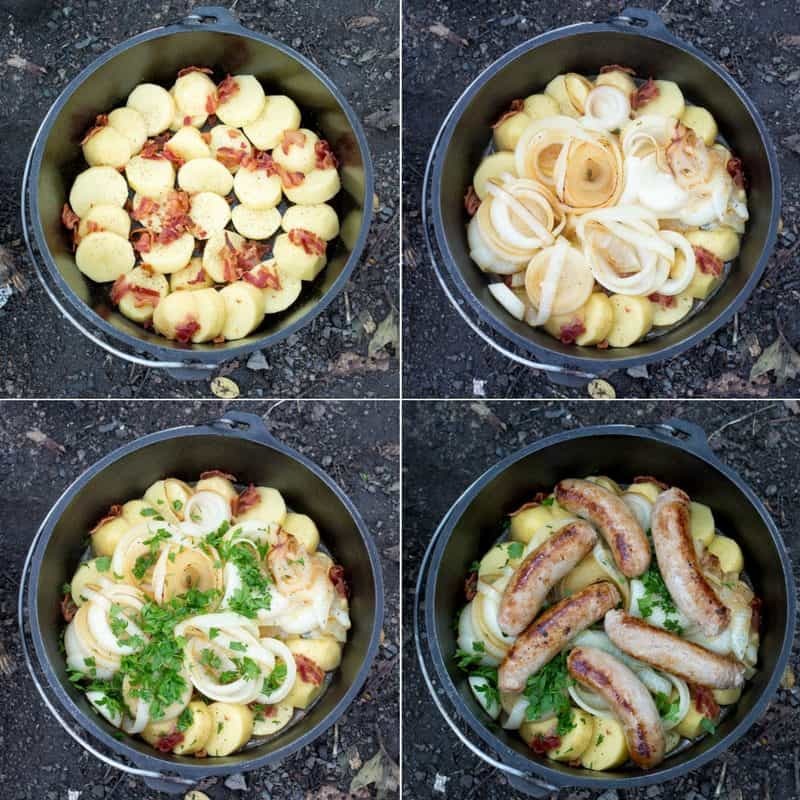 We love cooking outdoors on an open fire and especially love our Lodge Camp Dutch Oven for stews, soups and casseroles like this Dublin Coddle. 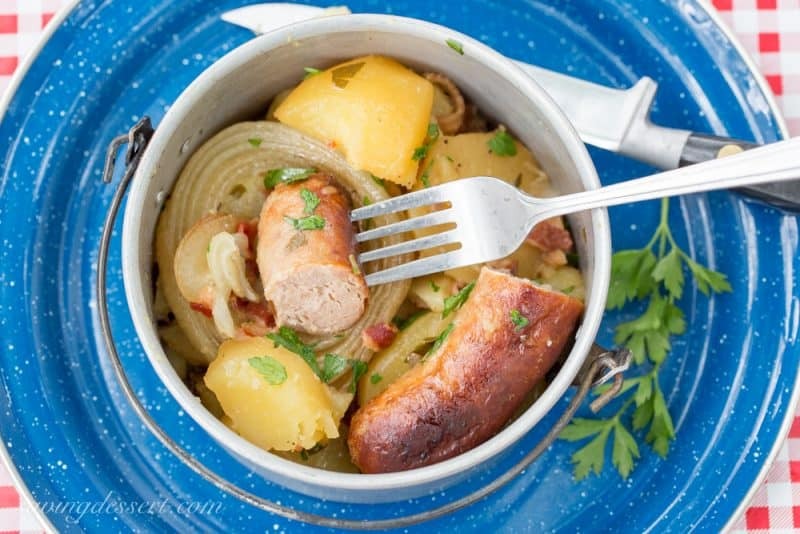 To be an authentic Irish Coddle, everything will be boiled together instead of layered and the sausages are not browned. 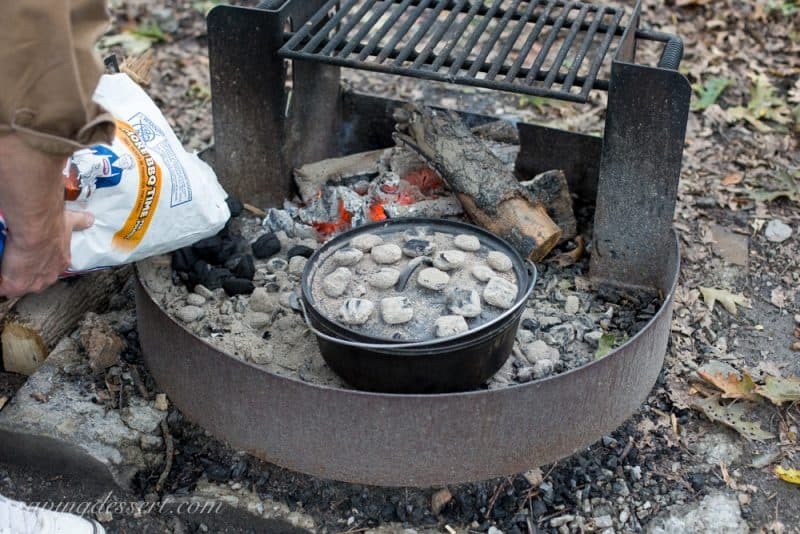 This is my adaptation since we were camping and we wanted to adapt the old style recipe for the Camp Dutch Oven. Since we live in the United States and bangers are hard to find here, I used bratwurst sausages which are also made of pork and slightly larger than bangers. 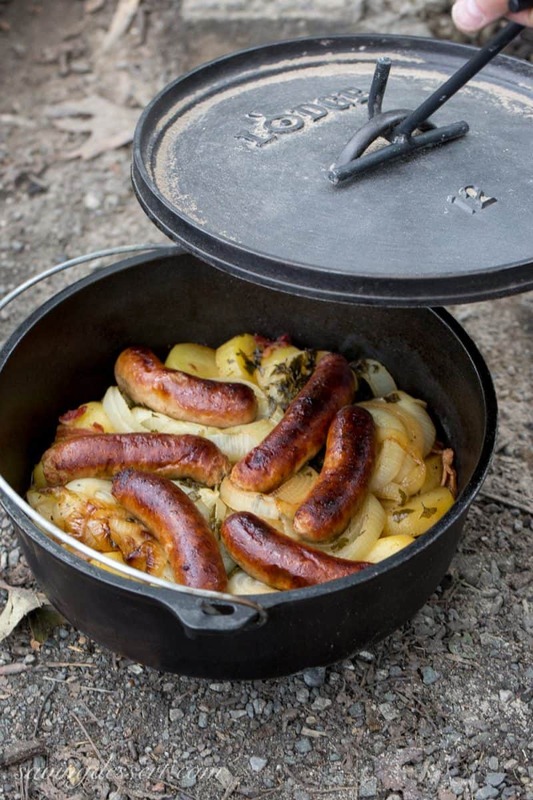 Our Dutch Oven is a 12-inch, 6 quart cast iron pot specially made for cooking over coals. As you can see in the photo above, my favorite sous-chef assisted with the food prep. He peeled the potatoes and I fried the bacon and sausages. What a team! You can also make this casserole in the oven at home using the same recipe. Layer the potatoes in the bottom of your Dutch Oven or casserole dish. Season them well with pepper and sprinkle half the cooked and crumbled bacon on top. Cook the onions in the skillet used to fry the bacon in about 3 tablespoons of drippings. Once the onions are softened, add the broth and vinegar and carefully pour over the potatoes. Add some fresh chopped parsley and the lightly browned bangers. Pre-heat 25-30 charcoals because you will need to put some on the bottom and some on the top to create an oven effect. There is a science to how many coals you should use. For a 12-inch dutch oven, you should double that number to 24 and divide by 3. Place one-third of the 24 coals on the bottom (8) in a checkerboard pattern and place the remaining (16) coals on top. You will need to replenish the coals during the the next couple of hours of cooking so be sure to have some ready. This is not one of those start it and leave it kind of dishes. A Dutch Oven should be monitored and the pot rotated every 15-20 minutes to even out any hot spots. Turn the pot clockwise a quarter turn and then turn the lid a quarter turn in the opposite direction. Isn’t that brilliant?! Since this is a casserole, not a soup, you will need to watch the broth to make sure the pot does not boil dry. After about an hour, add a cup or more of your favorite beer (Guinness is a popular choice for this dish.) Put the lid back on the dutch oven with a fresh layer of coals on the top and bottom. Next you will need to finish the bottle of beer if you didn’t put it all in the pot. You can also share with your sous-chef if desired. If you run out and buy a dutch oven, be sure to get the handy dandy lid lifter too! Once the potatoes are tender, dinner is ready. Add the remaining chopped bacon and a fresh garnish of parsley and serve. Serve this hardy dish with some crusty bread to soak up the broth. Talk about delicious! This recipe makes enough to serve four to six people, or only two with enough leftover for several more meals! It’s a shame we don’t eat sausage and bacon very often anymore. But with a weekend of hiking and walking, we felt a little splurge was okay. My husband and I both love this dish. I prefer this method over boiling the bacon and sausage which is a popular way to cook a coddle. By browning and cooking the bacon and sausage before adding to the pot, we are able to remove most of the rendered fat, so in some small way this is a tad bit healthier and the sausages look a little nicer than if they were boiled. No offense meant to the authentic Irish way to make this dish! Dublin Coddle – an Irish Classic! And finally for dessert my wonderful sous-chef husband once again proved that he is the master of the roasted marshmallow! 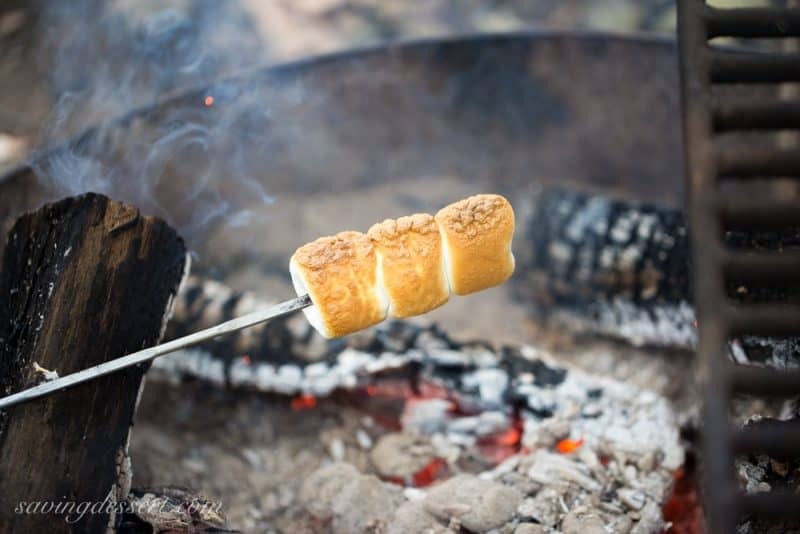 What fun is a camping trip without roasted marshmallows? 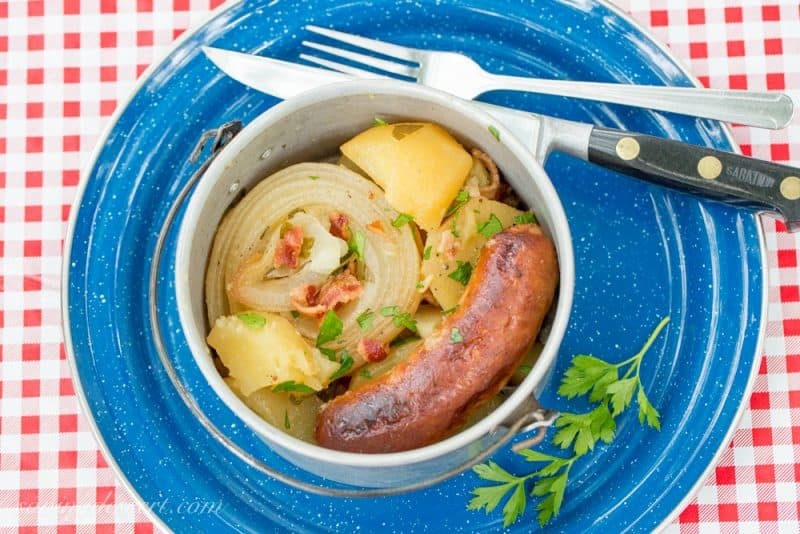 A traditional Irish casserole with potatoes, sausage and bacon slow cooked to perfection! Prepare 25-30 coals for the campfire. Lightly oil a 12-inch Camp Dutch Oven and the inside of the lid. 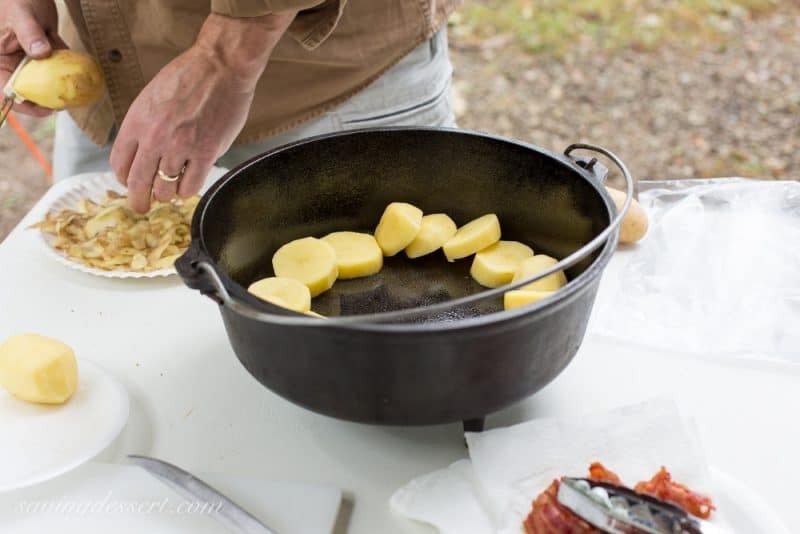 Layer the sliced potatoes in a shingle pattern on the bottom of the Dutch Oven. Sprinkle the potatoes with about 2 teaspoons fresh ground pepper. Cook the bacon in a skillet until crisp. Drain on a paper towel lined plate and set aside. Lightly brown the sausages in the bacon fat but do not fully cook. Set aside. Remove all but about 3 tablespoons of the bacon fat and discard. Add the sliced onions to the hot skillet and cook covered for 5-7 minutes stirring once or twice. Remove the lid and add the chicken broth, vinegar and season with black pepper. Bring the onions and broth to a boil. Remove from the heat and carefully pour the onions and broth over the potatoes in the dutch oven. Top the onions and potatoes with half the crumbled bacon and half the chopped parsley. Place the browned sausages on top and cover with the lid. Place the Dutch Oven over 8 hot coals spread out in a checkerboard pattern. Place 16 hot coals on the lid. Cook the coddle for about an hour, turning the pot 1/4 turn clockwise, and the lid 1/4 turn in the opposite direction every 15-20 minutes to prevent hot spots. Check the casserole to make sure it does not dry out and burn. After an hour add 1 cup or more of your favorite beer to the pot. Continue cooking until the sausages are fully cooked and golden brown - about 45-60 minutes. Continue turning the pot and lid as described above and add new hot coals as needed. You may need to sweep the ashes off the top of the dutch oven before adding new coals. Take care when removing the lid to avoid getting ashes in the food. Garnish with the remaining parsley and bacon. Serve and enjoy with a loaf of crusty bread to soak up the broth. Be sure to check the finished dish before adding salt. I use nitrate-free applewood smoked bacon which is a little less salty overall. Salt-free or low-salt chicken broth is also a good choice if you can find it. To cook the Coddle in the oven, lightly grease a dutch oven or covered casserole dish. Preheat oven to 325 degrees and bake covered for 1.5 hours removing the lid for the last 45 minutes or so. This is one of our best camping buddies. 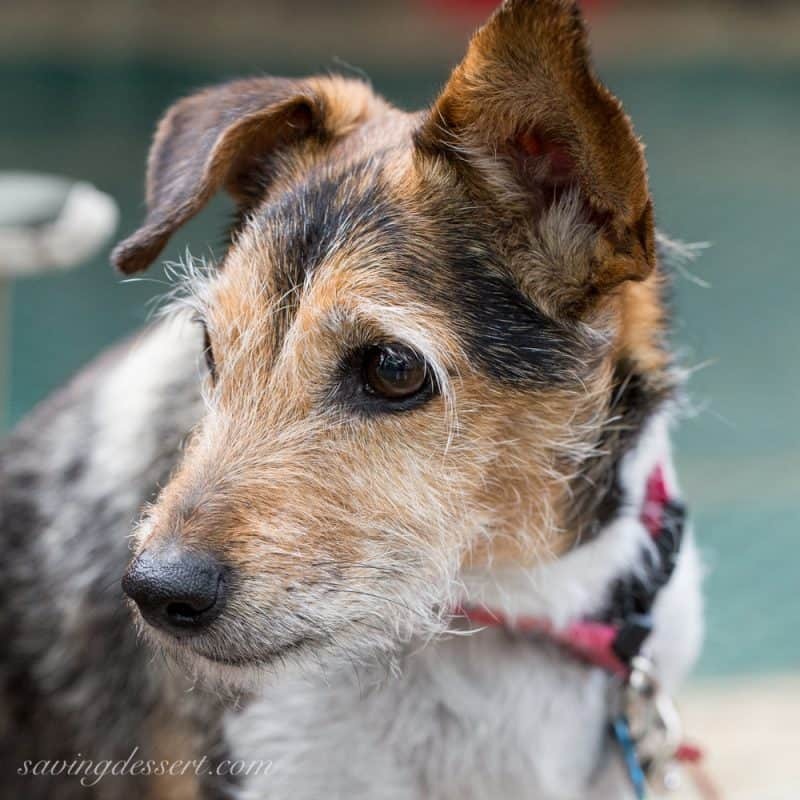 Mocha, a Parson Russell Terrier, is our grand-dog but has lived with us her entire 9 years so we have full custody. Simply, Mocha is the best dog in the whole world and she loves to go camping! I hope you have a wonderful fall weekend planned! It is supposed to turn a little cooler next week and we can’t wait. The weather in the mountains was perfect and we want some more! Thanks so much for stopping by! This looks amazing! 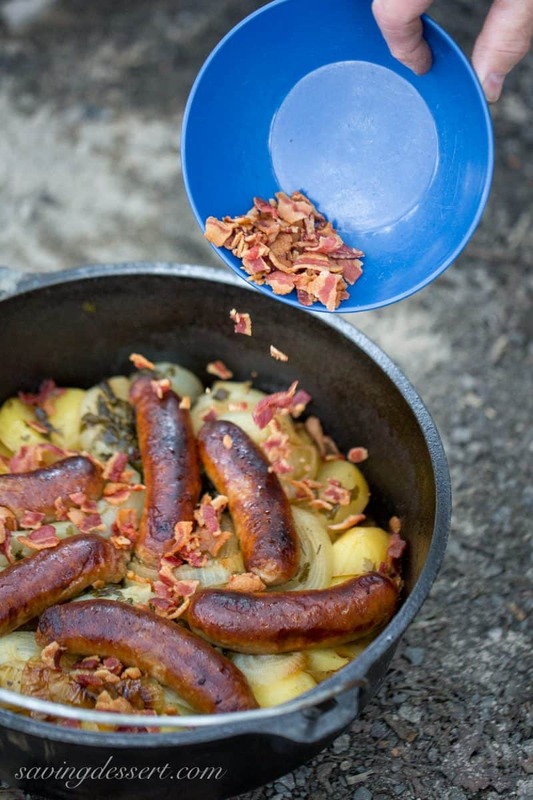 Do you cook the bacon and brown the sausage in the dutch oven before putting potatoes in, or a separate pan? Hi Fina. When making this recipe for the (indoor) oven, I just use the same Dutch oven for everything. I cook the bacon, then the bangers, then layer the ingredients. 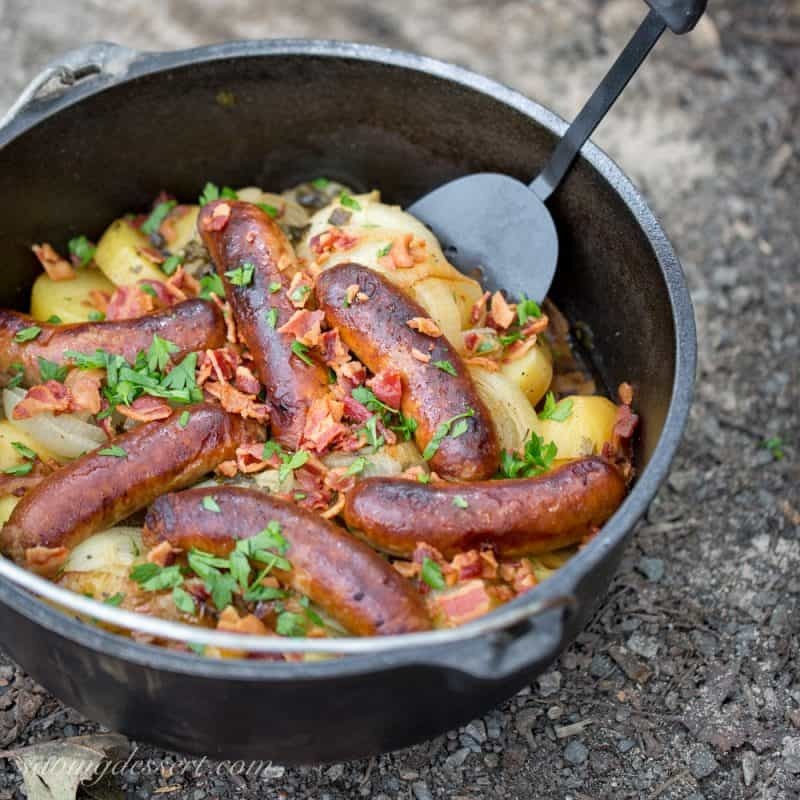 Since the heat is harder to regulate on the campfire, I use a skillet to cook the bacon, then the bangers in the same skillet, then layer the ingredients in the outdoor Dutch oven like in the photos. Great question! Can you cook this on your over? Where did you get your firepit setup? And I’ve ordered my 1st outdoor Lodge Dutch oven & lid lifter thru your site. Cant wait to try the Dublin Coddle. Look so delish! Hi Jan! The fire ring was at the campsite where we were staying in the Shenandoah Mountains. I don’t have one at home but need one so I can use my Dutch oven more often. I bet you’re going to love yours – and hope you’ll try a few of our camping recipes. We have a small camper and this Dutch oven goes everywhere it goes 🙂 Happy camping and thanks! I make this quite often but always add cabbage and cook on stove top in cast iron deep skillet covered for about and hour or so. Pretty much the same technique and prepping. Delicious !! I also am a huge outdoorsman and love to cook ! This is what I will be cooking for St. Patty’s day this year !! I’m going to add cabbage next time I make this, which is usually when we are camping. Such an easy and hearty pot of delicious, especially after a long hike. Thanks so much! Hi Tricia this looks like our kinda dinner indoors or outdoors. The snow is flying here so indoors will be our first try tonight. I was wondering if you could add cabbage to this dish and if so when should I add it. Also should I increase the cooking liquid if I do? Looking forward to trying this out. Thanks for the yummy pictures and Mocha is adorable!! Hi DeAnna – it’s so bitter cold this winter, I know this will be the comfort food you’re looking for. I think adding cabbage is brilliant and I will do the same next time I make this. Depending on how much cabbage you use, I would add another 1 cup of chicken broth but check it after the 45 minute mark to make sure it doesn’t dry out. Good luck – you’re going to love it! Traditional Dublin Coddle is a white stew. All ingredients are cooked from raw in the cooking liquor. No Alcohol is used in this dish. The old Jurys Hotel in Ballsbridge, Dublin had this dish on their Caberet nights. Ann. I can’t comment on how this turned out, as it is still in the oven. I’m sure it will be delish, though. A couple of questions about the oven instructions: 1) there’s a direction to put in half the bacon and half the parsley, but no instructions about when to add the second half, and 2) when do you add the beer to the pot? Hi Kathryne – thanks for the great question. Under No. 8 of the instructions it states when to add the beer, which is about an hour into cooking. The remaining bacon and parsley is scattered on top as a garnish before serving. I’ll update the recipe. I noted it in the text but missed it on the printable copy. Thanks for catching it. I love this recipe and hope you do too. Thanks for giving it a try! I’ve never been a fan of camping outdoors but it sounds like your enjoy it to it’s fullest, Tricia. With a delicious meal like this, what’s not to love 🙂 I’ve made Dublin Coddle before but I’m sure yours tastes so much better cooked over an open fire outside. It looks so good! Your Mocha has such a sweet face. What a cutie! Thanks Susan. There is something about being outdoors that clears my mind and cleanses my soul – it may sound a little extreme, but I NEED to be outside sometimes. LOVE it! 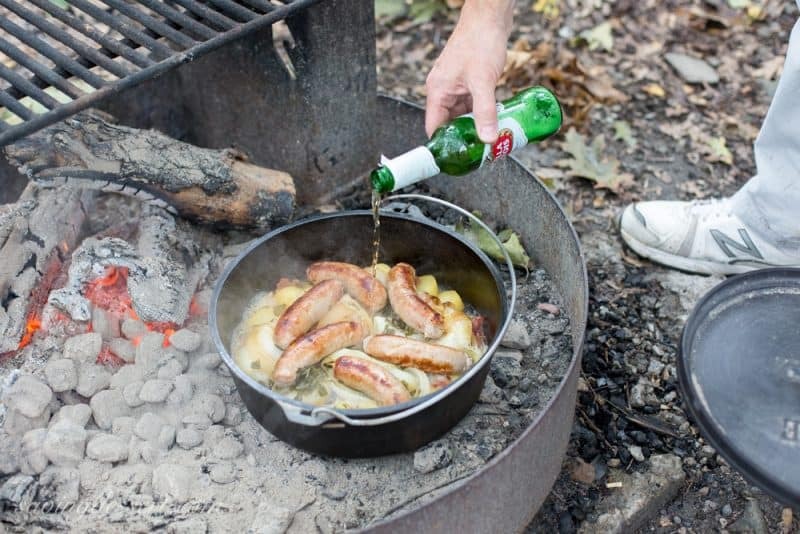 what a brilliant dish, served au-naturale… you can imagine back in the olden times, on a trail, with their wagons behind them, making this glorious dish… maybe not using bottled beer but hey, the future is bright! Brilliant post! I am right there with you! Thank you so much Dom – love your vision of cooking on the wagon train 🙂 Such fun! This could be a German dish. It looks delicious and cooking it over a campfire makes it taste twice as good. In Germany the sausages are sometimes heated in sauerkraut and the potatoes are cooked separately. There isn’t a specific name for it. Oh my goodness, Tricia, every time I see this dish I get so excited! We have a family reunion every year with about 60 cousins in a campground on the shores of Lake Huron. We have Irish ancestry and everyone loves to visit Ireland as much as possible. I have GOT to share this dish with them! Wow sounds like you have a fun family! Thank you so much for sharing this post – your camping trip sound wonderful. Have a great weekend. I think camping is in your future Sara! I remember camping as a girl scout and we made hobo stew. It was ground beef browned in a skillet then mixed with a can of Campbell’s vegetable soup. The stew was then put on a bun. Easy and it actually tasted pretty great. Enjoy! Looks so good..that first and last pic:) Man w/ the hand .. and doggie..beautiful.. I love a campfire:) outside in my daughters backyards..and that’s it. Thanks Monique. We have a pop-up camper and this campground has running water and clean facilities 🙂 I have backpacked on the Appalachian Trail and slept in a hammock outside. Very cool! I love being outdoors. Hope you have a wonderful, beautiful fall weekend. We did have a nice quiet time in the mountains. The food was pretty great too! Have a lovely weekend Monica. Hi Trisha, today we woke up to rain and this Irish coddle would be perfect for our dinner. The sausages look perfectly cooked, and the marshmallows do too. Your little Mocha is adorable. 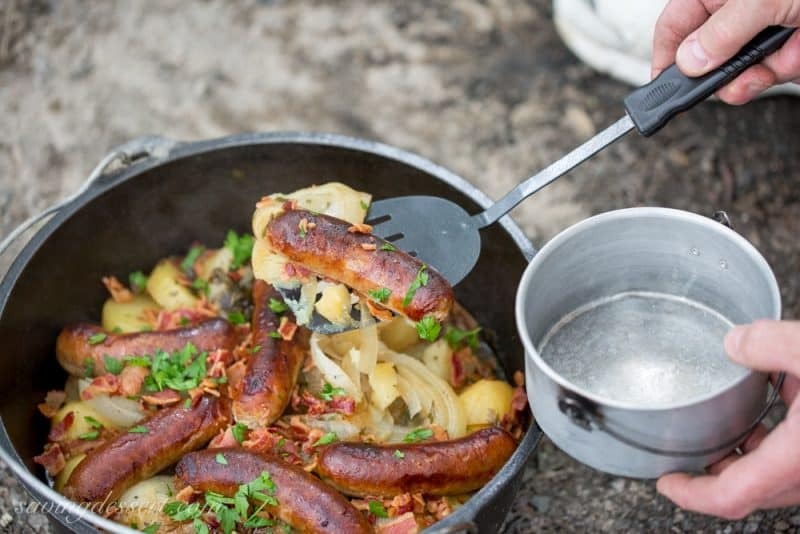 A fabulous dish and no doubt 1000 times better when cooked over a fire and eaten in the great outdoors 🙂 I don’t camp, but I do have a fire-pit. Will try this before the snow flies! Oh I want a fire-pit! Since you live in the great outdoors – I guess you don’t need to go camping. I hope you love it and I am anxious to hear what your husband thinks too 🙂 Gotta love that Irish comfort food! 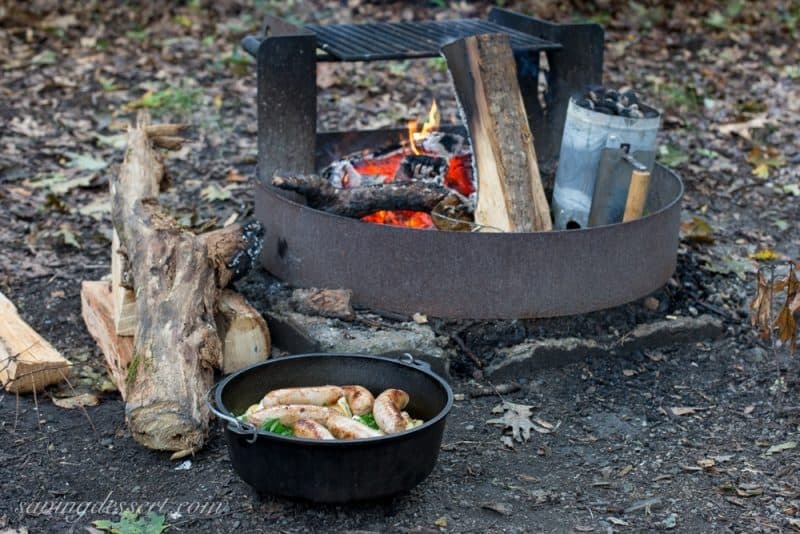 This is fabulous — your photos are incredible, I feel like I was right there with you in the woods 🙂 We don’t camp much, but we love Irish food so I’m definitely going to make this on my boring old kitchen stove! I hope your camping ‘buddies’ got a taste of this stew! Thank you so much Sue – I wish you could come with us or at least come by to share a bowl around the fire. I know you will love this in the oven too. Have a lovely weekend! Thanks Karen – this is definitely man food! Have a lovely weekend and thanks again. What a fun post Tricia. The coddle looks fantastic but I know, after being outside all day it was even better. Somehow, everything tastes better when your camping. And the aroma of bacon cooking outdoors is about as good as it gets! It really is delicious Chris and surprisingly so with only a few ingredients. Yeah camping! Hope you have a wonderful weekend! Not a camping fan, but cooking outdoor is kinda fun, isn’t it? This is indeed an exceptional treat! Yes it is Angie! I love being outdoors and especially in the Fall. Have a great weekend. As I am from Dublin, I have had this dish many times . I must say yours is far better looking than the conventional,Great job .. This comment made me so very happy Jeanne! Thanks for stopping by – we truly love this dish and can’t wait to make it again.